Get a free quote on fast, friendly auto repair for your car today. Trust your auto repair needs to our reliable mechanics and the family owned Howard Ave Radiator team. The community has trusted us with their heating and air conditioning needs, automotive repair and service for more than thirty years. Fast and friendly service from trusted professionals. No hassle repairs with free up front quotes and guaranteed pricing. 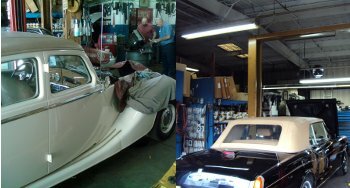 We provide more than auto repair - we provide peace of mind you can count on, because we love cars. Located in the heart of San Carlos near El Camino Real. Give us a call at 650 595 3540 or drop by Monday through Thursday 7AM-5PM or on Friday from 7AM-4PM. We service and repair most models and makes as well as some industrial vehicles. During the winter it's important to protect your vehicle and make sure that your heating systems are running at optimal performance. When it's cold outside, the last thing you want is for your car to be an ice box on wheels. Just as it's important to ensure the heating system is working well, in the summer, the last thing you want to do is arrive at work or a run an errand looking like a sweaty pig. Our professional staff will ensure that when you drop off your car to get repaired if it's a heating and air conditioning job, general auto repair service or similar, the job is performed with speed, integrity and reliability. As people who love cars, we understand how important it is to be able to count on the team that supports your vehicle. While we are located in San Carlos, California our shop is so convenient that we frequently have customers from Redwood City, Belmont, Redwood Shores, Menlo Park, Emerald Hills, Woodside, Palo Alto and San Mateo. The extra drive of twenty minutes or less is paramount to ensure your car is treated with the kind of care and attention to detail we deliver, because we treat every car as if it were our own.